Square hollow sections or square tubes are cold formed and welded from either hot rolled, cold rolled, pre-galvanized or stainless steel. In order to form the square steel section the appropriate mother tube, a round steel tube, has to be formed first. From a round tube rolls are used that progressively press the round tube into a square hollow section. This is all done inline. 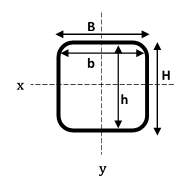 For example: A round tube with an outside diameter of 50.8 is pressed into a 40x40 square tube. Square and rectangular steel tubes have the advantage of being stronger in bending while a round hollow sections has more stiffness in twisting.